What are the Learning Design Types? All three of these roles can be applied to Digital / eLearning. ELearning covers the full spectrum of electronically supported learning and teaching. Information and communication systems, are the media used to implement the learning process. The terms Educational Design, Learning Design and Instructional Design are used interchangeably depending on the nature of the work and the environment in which it is carried out. A skilled designer in this field can move between all three of titles - Learning Designer, Educational Designer and Instructional Designer - within their working life. An instructional designer may have difficulty carrying out the work of an Educational Designer but may manage Learning Design roles. 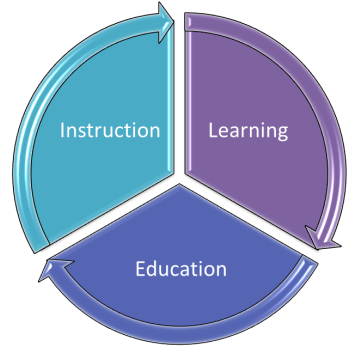 The Learning Designer can usually carry out the role of an Educational Designer as long as they have formal training in the Learning Sciences. Educational Design is at the top of the 'tree' because they definitely need formal training in learning and teaching as well as current knowledge of the Learning Sciences. Educational Designers tend to work on a variety of projects from a wide range of subjects whilst Learning Designers focus on one Subject or one course. This means that an Educational Designer needs a greater variety of skills to meet the demands of their varied work. The Learning Designer may need to work more closely with the content so would need greater attention to detail.